I am David D. Bravo, a personal injury lawyer serving clients from New Orleans and throughout Louisiana. If you or a loved one has suffered a serious personal injury, I can help you seek the compensation you need to pay for your medical bills, wage loss, pain and suffering, and other hardships. I have been practicing law since 1996 and have a proven record of success obtaining results for my clients. As a former insurance defense lawyer, I know firsthand about the strategies insurance companies use to limit and deny injury claims. This helps me devise legal strategies that help my clients obtain the compensation they need and deserve. David Bravo’s training as an advocate began long before law school. In high school, David was a nationally competitive Cross Examination debater. He spent his summers learning to persuasively speak and research at prestigious institutions such as Dartmouth College, The University of Toledo, and Loyola University. He won the Louisiana High School State Championship and placed in the top ten at the City Championship three years in a row for Extemporaneous Speaking. In college, David won LSU’s Persuasive Speech Contest. At Loyola Law School, David earned a scholarship as the swing oralist on the Moot Court National Team which required him to argue both sides of the issue. His team won the Regional Championship and finished fifth in the nation. Immediately after graduation, David was baptized by fire as he worked as a prosecutor in Orleans Parish. He quickly rose to Senior Trial Attorney and began handling serious felony cases, including death penalty cases. David tried nearly a hundred cases as a prosecutor, including three jury trials in just one day. 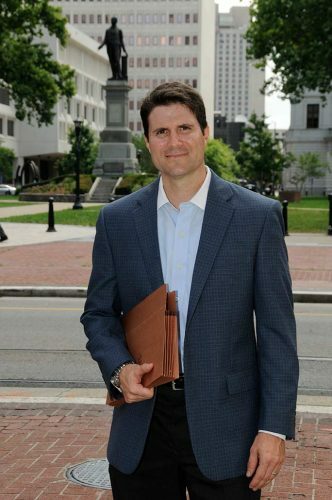 After leaving the DA’s office, David worked for a downtown insurance defense firm. During this period, David learned how insurance companies evaluate cases. He also learned that his personal satisfaction came from representing people, not big insurance companies. For the last 12 years, David has represented only individuals and small companies. He has used his experience in evaluating and trying cases to achieve justice for his clients. He continues to actively train as an advocate. He recently spent a month at the Trial Lawyer’s College at Thunderhead Ranch in Wyoming, founded by famed trial lawyer Gerry Spence. David has also taught Trial Skills Courses at Loyola Law School. David would be happy to meet with you to see if his unique set of skills can help you with your current challenge.